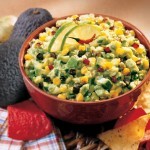 In honor of Cinco de Mayo, here’s a chunky guacamole that gets its bite from Serrano chiles. I’m eating some right now and my eyes are watering! It’s great. The recipe is from Raley’s, a regional grocery store chain. I didn’t measure anything; I just threw it in there. 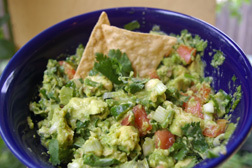 Place chopped avocado in bowl and stir in lime juice. Add remaining ingredients and combine. 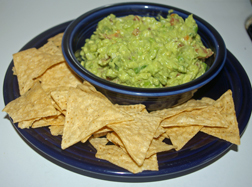 This recipe for sports figure John Salley’s Slam Dunk Guacamole is from the California Avocado Commission. It features corn, jalapenos and onion. It’s a very California-style take on guac. Another version of this recipe replaces the garlic with John Salley’s Garlic Chipotle Sauce. Preheat oven to 450 degrees and line a baking sheet with foil. Toss corn, chilies and onion pieces with oil in a large bowl, and then spread in a layer on baking sheet. Roast 14-20 minutes until lightly browned. Peel and chop jalapenos and onion. Mash avocado with lime juice. Stir in remaining ingredients. I decided to put my own spin on the citrus guacamole from Sunset magazine. I used mandarins instead of navel oranges, added more lime juice and left out the chili flakes. It was tangy and tasty. Peel avocado and cut into chunks. Peel mandarins, remove as much white membrane as you easy can, and separate segments. Cut each segment in half. 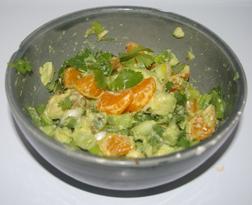 Stir oranges in with avocado chunks. Add lime juice, green onion and cilantro and stir. Salt to taste. 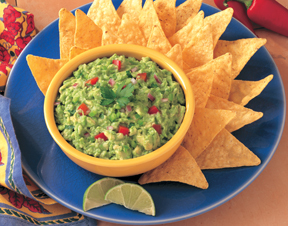 One of the best things about guacamole is there are really no “rules.” Professional and home chefs can experiment and add all kinds of tasty additions to avocados, giving the dip their own twist. This recipe features goat cheese, cilantro and pistachios and is courtesy of the California Avocado Commission. Coarsely mash avocados. Fold in remaining ingredients. When it comes to guacamole, or any avocado-based dip for that matter, it’s important to consider individual tastes as well as regional preferences. For example, some families wouldn’t show up at a party without adding mayonnaise or sour cream to their avocado dip. I’m not a fan of mayo in my guac, so this batch was not one of my personal favorites. 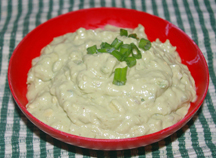 However, many people love this style of dip (and adding mayo makes it go further), so I’m including a popular recipe from a book of recipes from home economists and La Victoria called California’s Favorite Mexican Foods. Mash avocado and mix together all but the mayonnaise. Spread mayo on top, refrigerate and mix in the mayo before serving. I whipped up this guacamole (my own recipe) for a family party, and the green onions added just the right amount of crunch. Include as much or as little garlic as you like, depending on your family’s tastes. Mash avocado. Prepare green onion and tomatoes and stir into avocados. Add lemon, garlic and salt.